We may need to split the string with some separator in SQL Server. To cater this need, I have one function which I am using since very long time and felt to share it with you. 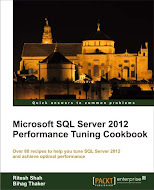 Have a look at it and enjoy the power of T-SQL programming. Note: I don’t remember whether I have written this script, modified it or got it somewhere from internet as I am using it since long time.